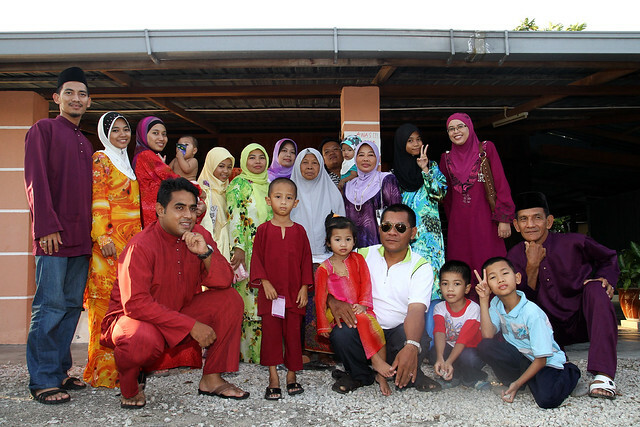 On the 4th Raya, Nyai wore her purple new baju kurung. Luckily I have my 3 year-old purple baju melayu. So I was going to wear that to match her outfit before I realized someone else has already wore it. My dad!! Ahahaha~~ D.E.M. 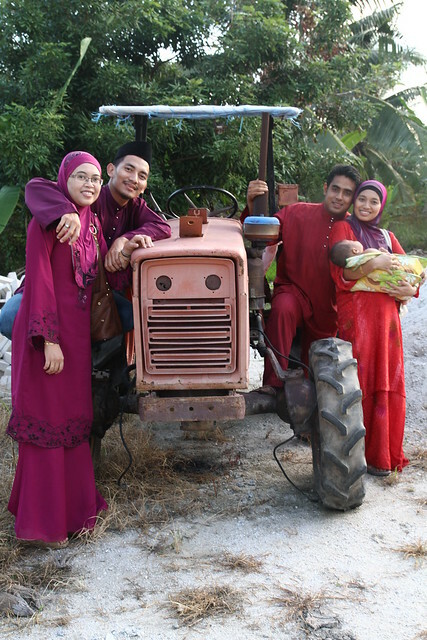 So I had to wear the other purple Baju Melayu that we made for our family during our wedding last time. But it doesn't come with the pants. When we were getting ready, my mom showed us her newly made baju kurung that used the 'kain pasang' that we bought together with her before Hari Raya. Mom managed to get it ready on time. She was so happy to wear it. Well, that was before suddenly my dad went to her room asking Mom what was she going to wear. 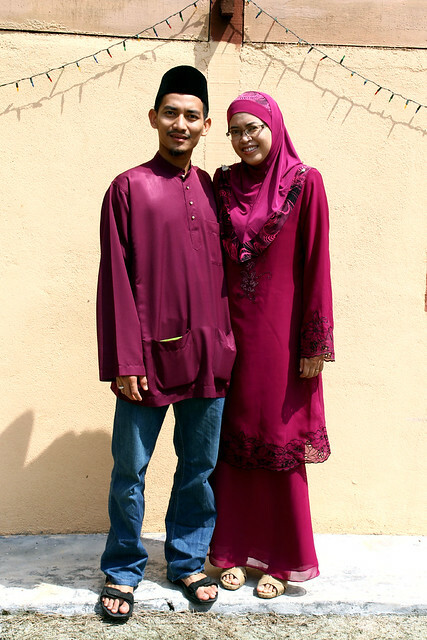 Ekekeke..It seems, abah wanted to have the lovey-dovey feeling that we shared by wearing the same colour. 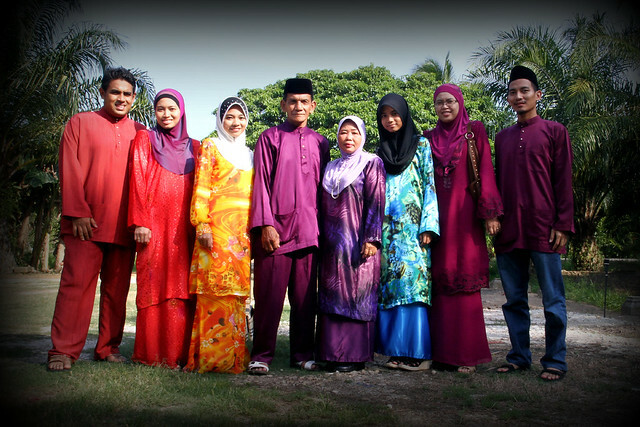 When Abah looked at our matching purple, he asked mom to wear purple as well coz he was wearing my purple baju melayu at that time. Mom was like refusing "alaaa~~~ dah cantik baju ni. Nak tukar pulak~~". Kekeke..sian my mom. Her new baju kurung mood was spoiled. So Mom changed to her purple baju kurung that we made during our wedding. Then we went to one of our relative's house situated in the middle of the padi field. A nice view. We've went there twice. Our uncle's family tagged along too. They chatted about life and it was time to leave. But before we leaved, we took our pictures together. Tengok je la bapak aku tu...bukan main lagi gaya pose. Sama la ngan menantu dia baju merah tu..ahaahahaha!! 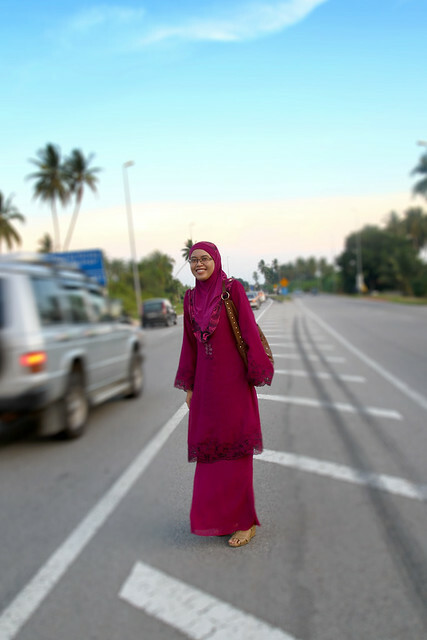 On the way to cross to the other side of the busy road, I managed to take my wife's shot in the middle of the road. There's a nice space in the middle of the road where cars could stop to make turns, so we utilized it nicely apart of the busy road. every pic, i love your dad's spirit of making it fun! ala pakai jeans dgn baju melayu..
cam ada kecacatan di situ..
shuke nyer tgk pic 1st tuh!.. apa jawapan ko kat cousin ko tu?? errr.. tenkiu... :D tp cousin ko tnya ko syg cembam ke tak?? bukan tnya syg aku ke tak?? aku dah lama tau ko syg aku..